It may only be September but in Germany it’s time for Oktoberfest, Munich’s famous beer festival! 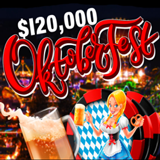 There'll be plenty of oom pa pa and ya ya ya at Intertops Casino this month during their $120,000 Oktoberfest casino bonus event. While Germans raise their steins, Intertops Casino players will be competing against each other for top bonuses. Every week, 300 players will win up to $500 each. Intertops Casino players earn points for playing and compete for top casino bonuses. So from now until October 2nd, Intertops Casino will award $30,000 in casino bonuses to frequent players every week. Intertops Casino players automatically earn frequent player points when they play any of the casino’s hundreds of games from Realtime Gaming. You can earn points by playing download or instant play games on their desktop or laptop computer, or by playing in the mobile casino on yoursmartphone or tablet. You'll be ranked on a Scoreboard according to your points. Moving up one or two positions can mean winning hundreds more, so competition between players can be very intense. If you make it to the top twenty any week of the promotion you'llbe entered in a final draw for a $1000 cash prize with no wagering requirements.